Cinnamon Swirl Almond Bread — Low Carb with a Crunchy Topping! 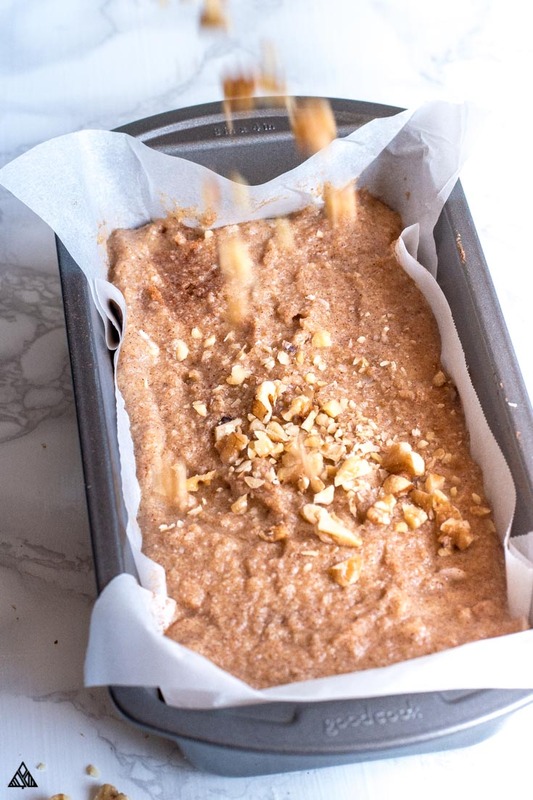 If you’re looking for the ultimate guilt free, gluten free, low carb treat, then look no further than this cinnamon swirl almond bread recipe! The walnuts on top add a nice little crunch while the swirl in the center is full of cinnamon-y deliciousness. Slice and toast it on up just like regular low carb bread — then smoother it in cream cheese or butter. A delicious midday snack, after dinner treat, or breakfast with your morning coffee. 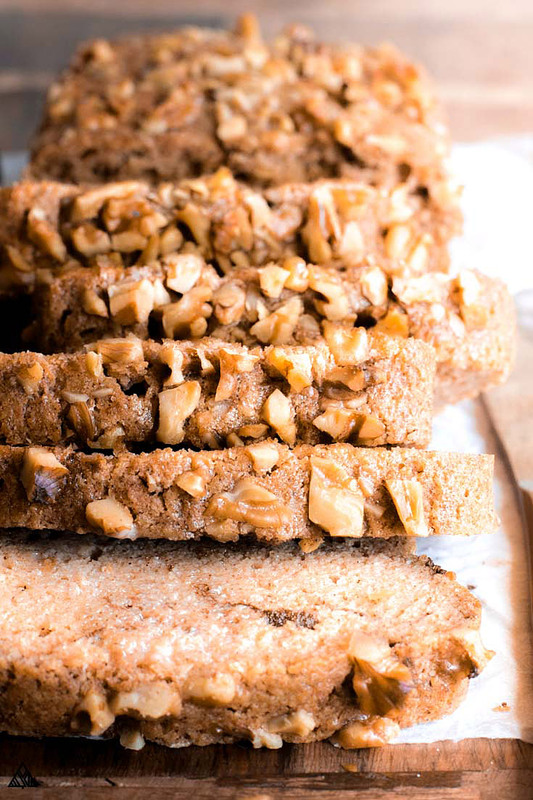 This almond bread recipe is a winner, and whether you eat carbs or not, you’re gonna love it! If you’ve tested a low carb bread recipe before, there’s a chance you didn’t love it — maybe it tasted eggy or dry? 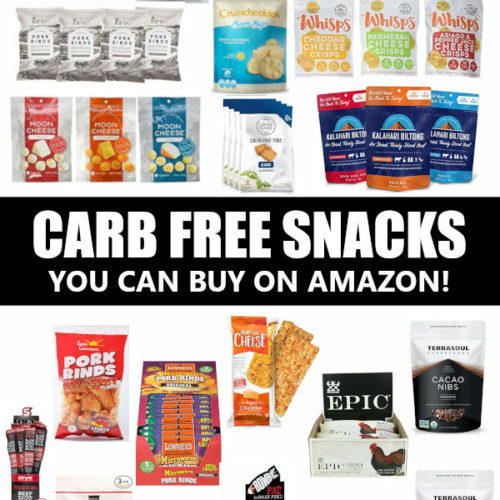 Both are common with almond and coconut flour bread recipes, as the ingredients used in low carb baking have a different set of rules than traditional baking ingredients. 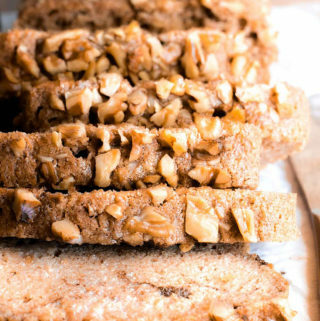 With a whopping 24.8 grams of carbs per ¼ cup, we’ll skip the wheat flour in this almond bread. Instead we’ll use my favorite low carb flour alternative: almond flour. 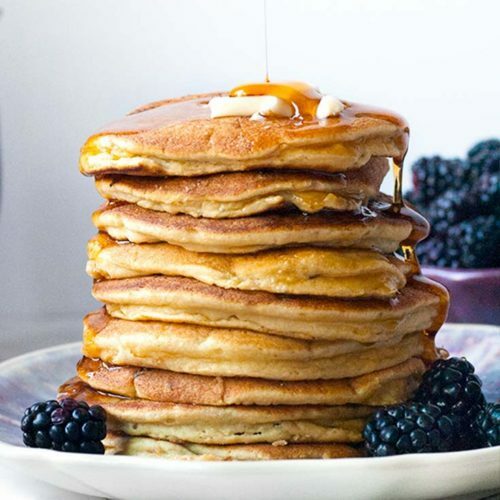 By making this simple swap, we’ll save 18.8 grams of carbs per ¼ cup! Almond flour also lacks wheat gluten, which helps bind ingredients together. 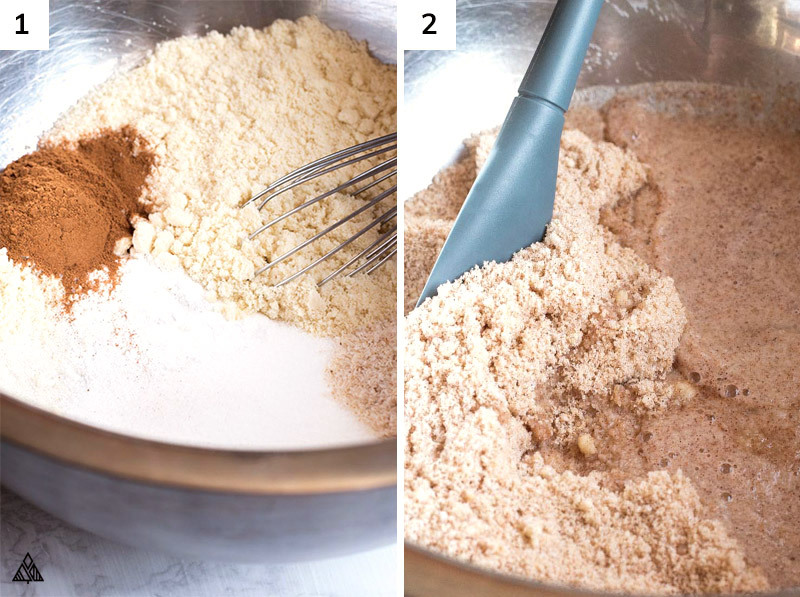 For both of these reasons, baking with almond flour requires additional ingredients. Instead of an almond flour bread recipe with yeast, I chose to use an ingredient that doesn’t require sugar to activate: psyllium husk. 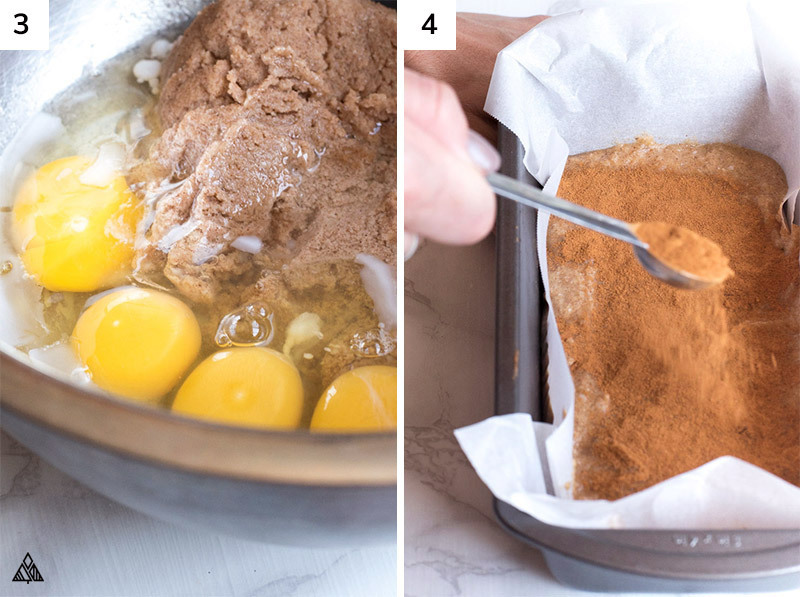 Which may seem like the keto bread ingredient you want to skip, but trust me, you’ll regret it if you do! It’s extremely fibrous and absorbs the liquid added to the almond bread batter, which binds the ingredient together, and creates a fluffy, solid loaf of almond bread! This ingredient can be purchase online, or in most health food stores. Be aware that many brands of psyllium husk can turn your almond bread a blue-ish purple — I always use NOW psyllium husk and haven’t had this issue! There’s nothing better than a freshly baked loaf of sweet bread — except low carb sweet bread that is! Sugar is obviously crazy high in carbs, so let’s leave that out and use my favorite low carb sweetener instead: erythritol. 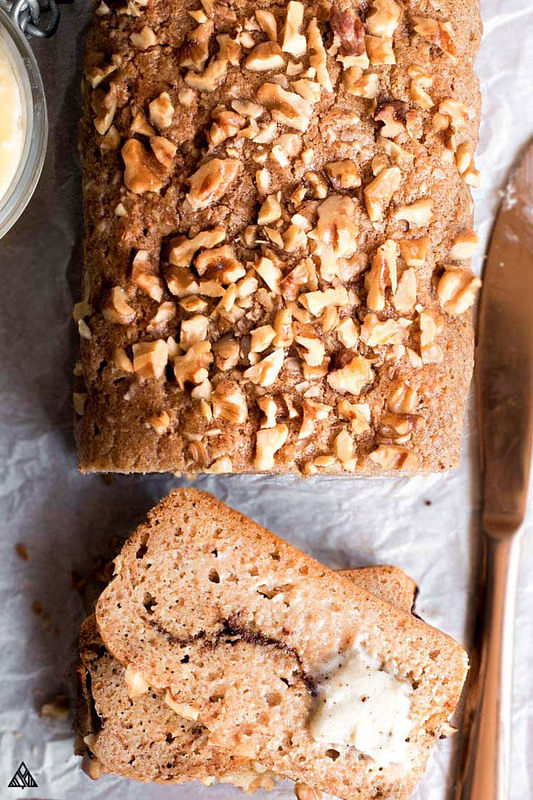 If you’d prefer an almond bread recipe paleo, swap it with whatever sweetener you have on hand. I’d love to hear what you try in the comments below! Since there are no preservatives in this paleo bread recipe, I store it in the fridge. If you don’t think you can eat an entire loaf of almond bread before its expiration date, slice it up, toss it in an airtight resealable bag, and place it in the freezer. Next time you’re craving cinnamon swirl almond bread, toss a slice in the toaster and your treat will be ready in minutes! Increasing, decreasing or swapping the sweetener. As is, this isn’t the ideal almond flour sandwich bread — leave out the sweetener and cinnamon if that’s what you’re looking for! Play around with the spices: some delicious spices to add would be nutmeg, cardamom or allspice. Go light on these, you can always add more, but you can’t take it out! Adding vanilla, coconut or maple extract. Extracts can be expensive, but they add a ton of flavor with just a little dash. 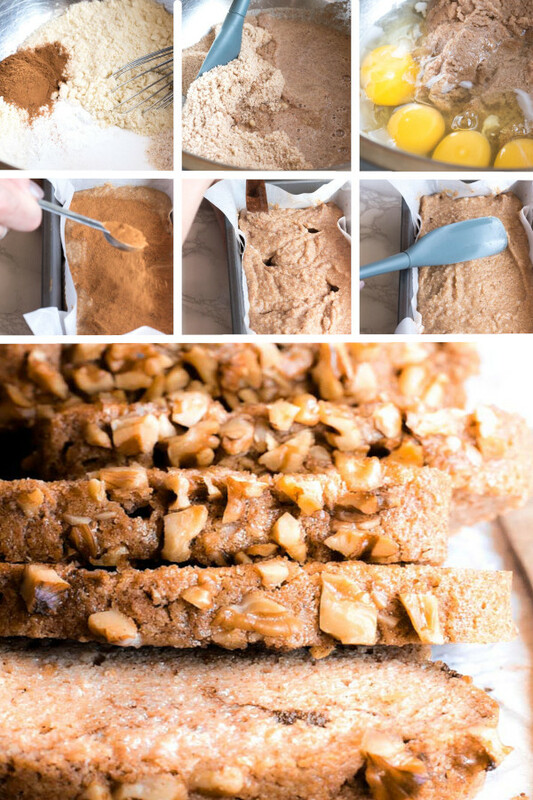 I know many of you are looking for a no carb bread recipe — and as low carb as this almond bread keto recipe is, it’s not completely carb free. This is because low carb flours still have a few carbs in them. Almond flour is one of the lowest, but it still container 6 grams of carbs per ¼ cup. Psyllium husk also adds a few grams of carb/fiber to the equation. There you have it crew! Everything you need to know and more about this almond flour bread recipe. I hope you love it as much as my family and I do! Report back and let me know how you enjoyed this healthy almond bread and what you enjoyed it with! 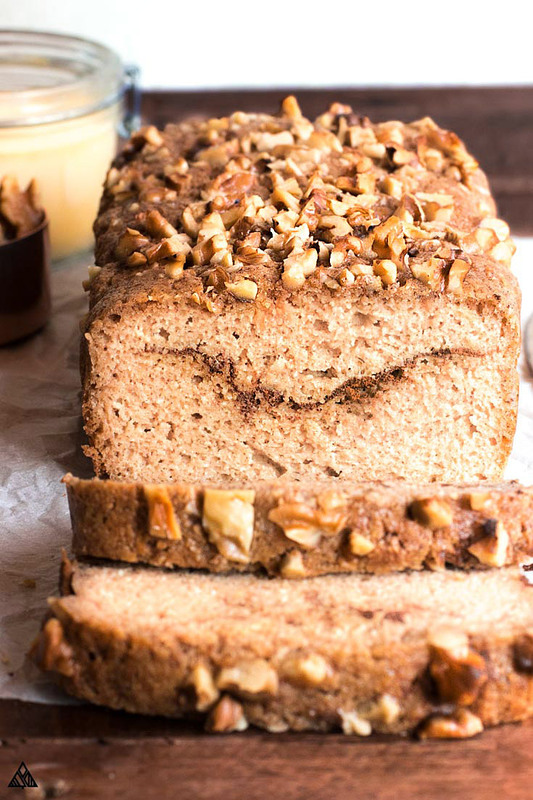 This cinnamon swirl almond bread recipe is the low carb dessert bread you've been looking for! Topped with nuts, swirled with cinnamon and baked into one keto loaf of deliciousness! Mix almond flour, psyllium husk, baking powder, salt, 1 tablespoon cinnamon, and erythritol together in a large bowl. Add hot water. Using a rubber spatula, stir until fully incorporated. Add eggs and coconut oil and stir to combine. Pour half the batter into a 8" greased bread pan. Sprinkle remaining 2 teaspoons of cinnamon over the top. Pour the rest of the batter into the pan. 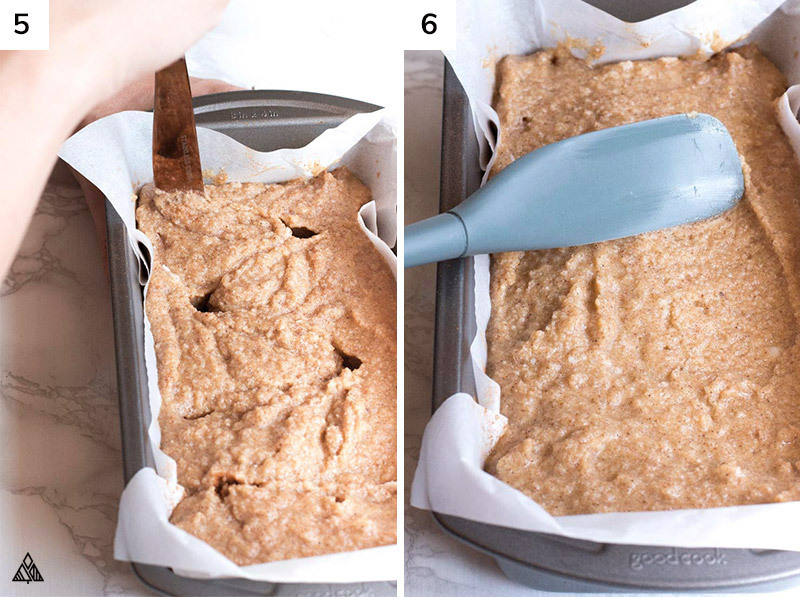 Using a knife, swirl the batter around to create a pattern with the cinnamon. Sprinkle chopped walnuts on top of bread. Place in the oven and bake for 40 minutes. You'll know the bread is done if you place a knife in the center and it comes out clean. Nutritional information is based on 1 slice, if you cut this bread into 16 slices. If you’d like to cut some carbs, try using less erythritol. You can also leave out the nuts! Whoever thinks low carb bread doesn’t taste as good as regular hasn’t found the right recipe yet. Sure, almond bread is a little different than a french baguette or ciabatta — and yes, it may take some getting used to, especially if that’s what you’re expecting. But the best low carb bread recipe may be waiting for you, you just have to bake it! Test almond bread recipe and find one that works for you. If you’re looking for a carb free bread alternative, steer clear of low carb flours, and work some magic with cheese — cheese crisps can be a delicious shell for your sandwich. 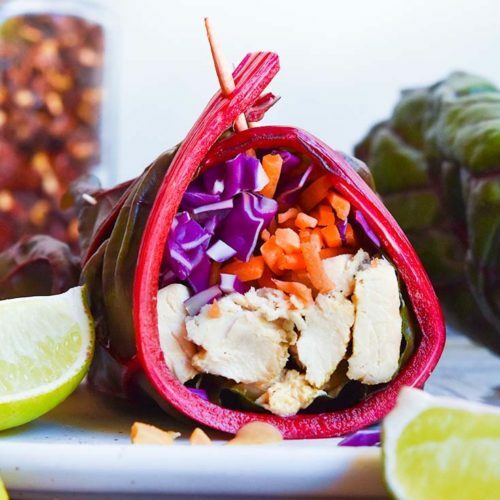 You can also try making lettuce wraps, or dill pickle stuffed sandwiches. There are plenty of options out there, you just gotta get creative! Made it with pecans on top and it was fantastic! 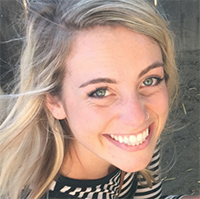 Can I use flaxseed meal instead of the psyllium husk ? Hi! I am just starting on the low carb lifestyle. I love bread so I tried this recipe. It was good but it didn’t rise at all. Is that normal? It was very dense so would not pour into the pan. Any advice on my next round would be very much appreciated! Thank you so much. Hi Carol! I’m sorry to hear your bread didn’t rise! There are a few reasons why this can happen, let me know so I can continue to troubleshoot with you! 1, it’s important to use a fine grain almond flour, as coarser grains (and almond meals) can weigh down the bread. 2, Check the expiration date on the baking powder, this is our main leavening agent. 3, did you use a ground psyllium husk? I’ve had the best luck with NOW psyllium husk. Did you use whole or ground psyllium husk?